Starry Night V6 | How to Register (Downloadable Version) – Simulation Curriculum Corp. If you enter the correct registration information in the registration window a green checkmark and the "OK" button will become visible. If you do not enter the correct Name and Registration Number in the registration window then you will only see the option to "Quit" (and "later" if installing from a disk). Please ensure that you enter both the name and number exactly as you see them in this email. 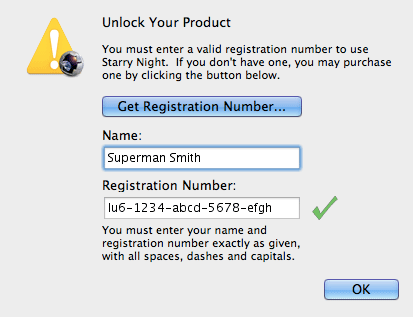 Be aware that sometimes the registration panel opens up with the Name field already auto-filled. Often this auto-filled name is not correct. You must enter the Name from your registration information (shown above in this message). The registration is cAsE sensitive. Copy and paste, both your user name and registration number for best results. This will avoid any possible ambiguity reading letters as numbers and vice versa. Do you see the green checkmark? If you don't see the green checkmark please re-read the paragraph above. 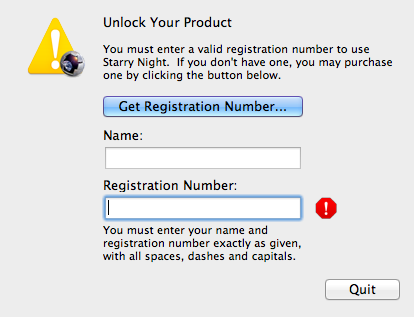 Only If you are installing Starry Night from a disk will the option to "Get Registration Number..." be available. This takes you to a webpage to sign-up. Registration information will then be emailed to you. This option is not available if installing from a download. If you are installing from a download then your registration was emailed to you. If you still need help please submit a ticket with support.